Jenkins, Ford and Green’s book is a natural continuation of Henry Jenkins’s seminal Convergence Culture: Where Old and New Media Collide (2006). It maps the landscape of contemporary popular culture and news by looking at events that challenge traditional notions of delivery and distribution of media, as well as the changing power relationship between brands/companies and audiences. Spreadable Media thus observes the significant shift from a top-down distribution model to a hybrid horizontal circulation model, in which the circulation (or “spread”) of content is increasingly driven by audiences, who will share, comment, critique, reframe and remix the content in previously unimaginable ways, for their own intents and purposes. The book is aimed at media scholars, audiences and practitioners, with a subtext of advocating change – perhaps this is more obviously targeted at the latter, but all the while appropriate for scholars and audiences that are interested in engaging in debates about media literacy and best practices. The concept of “spreadability” is itself an attempt to “correct” the notion of “sticky” media, as coined by Malcolm Gladwell in The Tipping Point (2000). “Stickiness”, as the word suggests, refers to compelling content that attracts and “sticks” with an audience, who wants to engage deeply with it. Thus, as Jenkins et al. suggests, “sticky content is material that people want to spread” (4). However, the model of “stickiness” largely exists within the old media framework; in the top-down model, where brands and companies control distribution from a centralised location; where engagement and experiences are unified and prestructured, rather than diversified and open-ended as they are in contemporary networked culture. While the authors recognise the prevailing value in the basic premise of “stickiness” (creating compelling content that is relevant to a large audience), they suggest the strategies surrounding it must be updated to provide greater autonomy and open access for audiences. Contrary to traditional belief, losing control of your property is not necessarily a bad thing – it should be designed in a way that encourages it. The authors claim their approach is “reformist rather than revolutionary” and that the changes and liberations they describe are largely driven by people rather than technology. While new networks and platforms have been enabled by the proliferation of technology, the popularity and practices of these are being determined by, “reconceptualizing other aspects of culture (such as gift giving, and social interaction), requiring rethinking of social relations, the reimagining of cultural and political participation, the revision of economic expectations and the reconfiguration of legal structures” (3). From Susan Boyle, to the Occupy movement, blockbuster TV series, Christian social networks, independent game design and ethnic cinema, the reader is presented with an array of case studies that illustrate how content is travelling and why people are spreading content in their digital growing and emerging digital networks. The idea of a “participatory culture”, a term coined in Jenkins’ 1992 book, Textual Poachers: Television Fans and Participatory Culture, remains at the core of the discussion throughout the book, and is perhaps even more appropriate in 2013, as social media remains an accelerating phenomenon. The book presents a discussion of existing terminology, expressing ambivalence towards many contemporary labels and descriptions of processes, calling for a rethink of metaphors that represent contemporary cultural media practices. Key examples are the way the authors are debunking the myth of “viral media” as offering too much power to content creators (whereas in practice its flaws can be exemplified by the ways that “virality” is often achieved by “accident” rather than careful orchestration), and the suggestion that the idea of “influencers” should make way for “grassroots intermediaries”, and how the latter can be said to represent the much-discussed democratization of media, as well as the way that previously rigid distinctions between producer, distributor and audience are becoming increasingly blurred. 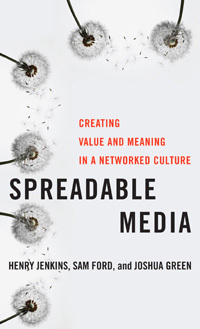 Spreadable Media is divided into seven chapters, which build on the key arguments. First, “Where Web 2.0 Went Wrong”, sets out by critiquing the shortcomings of the Web 2.0 mindset (in both media production and academic discussion,) and by questioning the logic behind “viral media”, describing it as an over-simplified notion of a controlled media flow in what really is an increasingly fragmented digital culture. The overarching argument is that traditional media practices and much academic writing can be seen to misrepresent the actual power relationship between content creators and audiences. The failure of the Web 2.0 logic was that it sought to extensively control audience engagement and limit access, while also being highly exploitative when it comes to labour. Thus, the prevalence of an ivory tower mentality and the urge to make short-term capital gains is largely to blame for the failure to create meaningful long-term relationships that could develop robust new business models. Chapter 2, “Reappraising the Residual”, draws upon Raymond Williams’ assertion that cultural change can be best understood by “looking at the ebb and flow of cultural influences rather than by taking a snapshot of specific content or groups” (96). One particular benefit of internet technology is the repository function that allows cultural forms to continue to exist over time, past their initial popularity, to be discovered and rediscovered, remade and remodelled, in ways that, as Will Straw argued, “fosters new forms of historical consciousness and collective memory” (97). Chapter 3 establishes “The Value of Media Engagement”, by looking at the “television industry’s gradual evolution from an appointment-based model to an engagement-based model” (152). It describes tensions between the television industry and unauthorised access to content. From an Australian perspective, this chapter is particularly interesting as the issue of piracy is largely presented as a reaction to industry short-sightedness, rather than “immoral behaviour” on behalf of audiences. In a networked culture, live interaction between fans and audiences are becoming normalised, and social media’s omnipresent role is making it difficult to avoid spoilers if access is delayed. Hence, a large portion of illegal viewing of media is taking place in countries such as where audiences have to wait for the content they desire. The authors make the case that piracy is not necessarily a matter of refusal to pay for content, but rather those who are accessing content illegally are doing it because “they are seeking to change the conditions under which they view it” (114). Australia repeatedly tops ratings of illegal downloads of torrents for blockbuster series such as Dexter, Game of Thrones and Breaking Bad and it is easy to argue that it is for the reason described by the authors. For example, within 12 hours of the season finale of Breaking Bad airing in the US, it had been torrented half a million times, and 18 percent of these downloads were made from Australia, where the show aired on pay TV later on the same day. However, this kind of viewing “does not count within the current logic of audience measurement” (114), because it’s not an action that directly translates into monetary value. The prevailing industry sentiment is that that for every item downloaded illegally there is a missed ticket sale. On the contrary, the authors suggest that an audience that actively seeks out content and who does whatever it takes to get it, should be rewarded rather than reprimanded – as the buzz that they create ultimately leads to increased spread and engagement which, in turn, may lead to more sales of DVDs and merchandise. In other words, they are adding value to the content. Yet, as the authors observe, “these illegal downloads are most often routed to the legal team rather than to the research or marketing divisions” (115). Chapter 4, “What constitutes Meaningful Participation?” continues the line of thought from the preceding chapter, and extends on Axel Bruns’ concept of produsage in a networked society – where audiences are not just consumers or users, but also producers of content. The chapter looks at musical phenomenon on YouTube, such as Crank Dat and Chocolate Rain, which have become subjects of an array of remixes, mash-ups, covers and parodies that have contributed to the relative celebrity status of Soulja Boy and Tay Zonday respectively. Bruns’ sentiment that “’produsage value’ has triumphed over ‘production value’” (cited on p. 184) is a compelling contention when considering the flexibility of the YouTube platform as a social network. The final three chapters move into a discussion of best practices. Chapter 5, “Designing for Spreadability”, encourages rethinking content creation strategies. The chapter draws on John Fiske’s notion of the “producerly”, as introducing “guiding principles for transforming commodities into cultural resources: openness, loose ends, and gaps (…) allow viewers to read material against their own backgrounds and experiences” (201). Spreadable content encourages fan-fiction, comment, critique and parody, by using devices such as humour, shared fantasies, recognisable references, open-ended narratives, mystery and “timely controversy”. The chapter uses several examples of ways that activists have strategically used familiar pop culture narratives, such as Harry Potter and Avatar, to spread political messages and mobilise to action. Chapter 6 discusses a range of strategies for “Courting Supporters for Independent Media”. Operating with limited promotional budgets, independent producers may be forced to take a path of discovery-first, financial compensation later. However, the authors contend that this has the ability to result in close and lasting connections to their audience, as the creators depend on collaboration and grassroots circulation to achieve success: “The free and open sharing of content can provide a valuable research tool for these producers, allowing them to see where (culturally and geographically) their texts spread and thus to build business models that might map against those pockets of audience interest” (235). The chapter continues into a detailed discussion of Chris Anderson’s much-read-and-criticised “Long Tail” theory (the idea that online technologies have liberated niche content, to create a less “hit-driven” culture, in which a broader range of content may find a sizable audience and thrive financially). The authors suggest that while Anderson may have been too focussed on people’s pull towards niche content, critics of the theory may in return have been too mass media focussed. In reality, most people are drawn to a degree of both. Therefore, they propose: “Success under Anderson’s Long Tail model relies on developing mechanisms for educating audiences and tools to help people find the texts they are most apt to value” (242). A further discussion of the challenges and successes of a selection of crowdsourcing initiatives, self-published writers, independent gaming producers and Christian social networks is driving the point home. The final chapter, “Thinking Transnationally”, consciously avoids using the word “global” in describing the spread of media – “in recognition of the uneven nature of these flows” (259) and the areas that are restricted from participation in transnational networks (such as third-world countries and countries excluded for internal political reasons). The chapter also recognises that as media flows across geographical and cultural borders, context and experiences will ultimately change and potentially cause frictions and divides, but it also has the power to bring together diasporas and to foster diversity of cultural experience. The latter is exemplified by looking at the spread of Nigerian films through Africa and to some degree Europe and the US, and the maturing of the local film industry. The “Nollywood” example, while describing grassroots and piracy circulation that are technologically different to those of the Western and developed world, provides a useful parallel in how the buzz and awareness created by such sharing practices is situated within the media ecosystem, as well as a common ethos. The chapter continues to draw upon the work of Arjun Appadurai, to explore how new meaning and value can be created when content that is meant to be geographically restricted travels across borders, using Prison Break as an example of how a mediocre performer in the US television market became a cult hit in China (“perhaps because its themes of strong fraternal ties speak so powerfully to local melodramatic traditions and to the generation that has grown up under the country’s one-child policy”). The example describes an interesting paradox again regarding concepts of piracy, as Chinese fans in the US added subtitles to the Prison Break episodes and passed them on to China, arguably for the purpose of cultural exchange rather than profit, to a market where it is doubtful the content would ever be made legally available. If we are to believe the authors, “Such ‘pirates’ might be the most effective agents Hollywood has for generating long-term interest in Western works in markets such as China” (272). While we are certain our focus on transformative case studies or “best practices” throughout may be dismissed by some readers as “purely celebratory” or “not critical enough,” we likewise challenge accounts that are “purely critical” and “not celebratory enough,” that downplay where ground has been gained in the media ecology. We believe that media scholarship needs to be as clear as possible about what it is fighting for as well as what it is fighting against (xii). Time to spread the word and sign up for the good fight.